Spent the weekend at Fort Sill, Oklahoma with Gary and Aimee. We left Lawton about noon, got on Hwy 7 east towards Arkansas. We stopped in Duncan at the Chisholm Trail Museum. The museum had an interactive video presentation about cattle run up the Chisholm Trail from Texas towards Kansas. When the cattle or a cowboy on a horse ran across the stage, the seats shook; when it rained, we were showered; when the cook was frying bacon, we could smell it; and, when it got windy, we could feel it! The art museum had a large number of paintings and bronze sculptures in it. 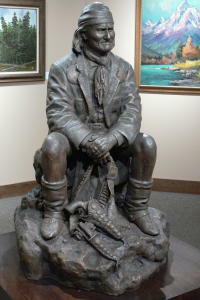 Noteworthy were the sculptures of Geronimo and the horses. Chisholm apparently was an Indian trader who spoke about 14 Indian languages, and developed a wagon path from Texas to Kansas to ship his goods. After the civil war, stray cattle had reproduced in Texas to the millions. Beef was scarce east of the Mississippi because of the heavy use by the military during the war, and some enterprising cowboy found and started using the Chisholm trail for running cattle to the railhead in Kansas for shipment to the East. Before long, tens of thousands and eventually millions of cattle were sent up this way. Free at the source, the cattle were sold for about $50 each at the railhead, and one run of a few thousand cattle could make anyone rich enough to retire. 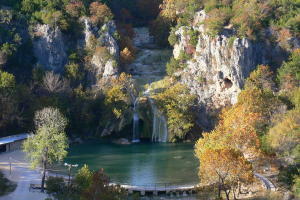 Further east near Davis at the Arbuckle Mountains, we stopped for the night at Turner Falls Park. This is an older (75+ years) recreation area, similar to Medicine Park near Lawton, used by generations past. And still attractive today. Doesn't that swimming hole look inviting? Just outside the Turner Falls area, up hwy 77 at Exit 51 on I35, is the Fried Pie bakery. We had a few pies, best we ever ate, for breakfast. Drove east on 77, then 7 then 1 towards Talimena Parkway. This parkway is a high ridge road, similar to the Blue Ridge Parkway, and part of the highest mountain chain between the Appalachians and the Rockies! Just off the parkway, about half-way to Mena, Arkansas, we stopped for the night at Cedar Lake campground, a Forest Service unit. 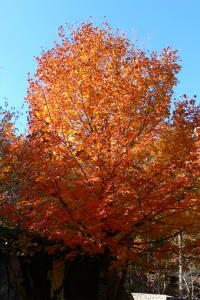 The volunteer campground host tells us that it will be cold tonight, about 26-28 degrees! We gathered some firewood, started a campfire and Patty had her first roasted marshmallows this trip. Well, it was 34 degrees. Sunny morning with fog lifting form the lake: very beautiful. We didn’t waste time getting on the road, and soon found ourselves taking in all of the lookouts with great views of the valleys below and the mountains in the distance. We were surprised to find out at Wilhelmina State Park that we were at 2640 feet elevation (just 60 feet or so less than the tallest mountain in Arkansas). At the end of the parkway, we found ourselves in Mena, Arkansas, a pretty town with several unique places to visit; unfortunately they were closed. One of these, on Main Street, is a replica of an old Esso station with many old cars in the shop. Behind the station is a genuine Studebaker dealer, or at least, one that existed at one time. Both the Avanti and an older pickup truck were in the show window ready to sell. 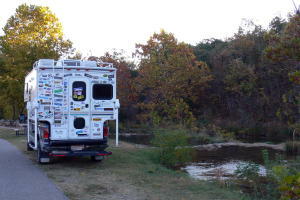 That store had more stickers than we have on the back of our camper! Gas was $0.19 for Extra at the pump! South on 71, we turned left onto 246 towards the Cassatot River. We found a rock beach where we spent at least an hour and a half collecting rocks! Turning back to 71 then south to 278, we turned east to the Cassatot State Park Visitor Center. Quite impressive center, but we found out that the campgrounds were up a dirt road at least five miles north from there. No problem: we put the truck in four-wheel drive and made a dust storm until we reached one of the campgrounds.